Have a passion for riddles about love? We hope you’ll adore this collection of love riddles with answers. Below you will find everything from funny and cute love riddles to love riddles for her & for him. Love is such a profound emotion and difficult to express. Grappling with what love is takes a fair amount of reflection and mental gymnastics. What is love? That is a love riddle itself with a thousand different answers. And even though nobody can answer that riddle for certain, you can enjoy and share these love riddles and answers. We have divided this into three parts: a general collection of love riddles, love riddles for her and love riddles for him. Enjoy and may your cup of love overflow! Why does love need sunglasses and a cane? What do relationships have in common with algebra? Haven’t you ever had an X and wondered Y? Why didn’t the watermelon want to marry the honeydew melon? What do love and math have in common? What did the iPhone say to the Macbook? Show them how adorable you can be with these cute riddles. I can break, I can be clogged, I can be attacked, I can be given, I can be kept, I can be crushed yet I can be whole at the same time. What am I? What did the pirate say to the prostitute pilot who was flying the plane wildly? I married your friend, I married your coworker, I may have even married you, and I married every girl that asks me to, yet I am still single. Who am I? I can be blind, I can be powerful, I can be difficult, deep, complicated, and tender at the same time. What am I? Why didn’t Adam and Eve have a date? How can a married couple who hate each other and are on the brink of divorce enjoy a romantic dinner and a bottle of wine at the same restaurant? A single man was looking for a girl to be his wife. After having no success with dating he put an ad online which said, “wife needed urgently”. Soon after he received tons of responses but all of them were from other men and all said the same thing. What did they say? I can make people happy I can make people cry, I can make people want me and I can drive people crazy. What am I? Megan is always sick and was constantly going to visit the doctor’s office. Meagan’s mom loved her so much and wanted to find a way to keep Megan away from the doctor. How did Megan’s mom keep her from seeing the doctor? How can you tell when a turkey is all ready for a date? Taylor asked Kate to some to his place for a seven course meal. But when Kate got to William’s house he only had burgers and beer. What’s going on? What did the left eyebrow say to the right eyebrow? What did the bird ask the bat on Valentine’s Day? I can grow fast, I can die slow, I can be a joy and pain as you may already know. What am I? What did Roger say to Jessica Rabbit on Valentine’s Day? Can’t get enough love? Check out these funny and romantic Valentine’s Day riddles! What do the tin of soup, the tin of sardines and the tin of paint want? If love is grand, then what is divorce? At least a hundred grand! What greeting do you say to a single person on Valentine’s Day? The rich and the poor need it, the desperate and the satisfied want it, the coward and the hero crave it? In fact, everyone desires it, yet the only person who can sense it is the one who has it. What is it? Did you hear about how Dracula met his girlfriend on Valentine’ Day? What date do single people have on Valentine’s Day? What did the female giraffe ask the handsome male giraffe? A guy in Rome married a lot of women again and again inside the exact same church without ever getting caught or in trouble. How did he get away with it? Tease her a bit and add a bit of romance with these love riddles for her. If you are fortunate enough to have a partner to play around with and who has enough of a brain to answer a few of these riddles for adults in love, then you are one lucky guy. And if you are really lucky, she will also enjoy these dirty riddles! What did the phone say to the WiFi? Why did the two lovers end up in prison? What did the toy wooden soldier say to the beautiful nurse when he visited the hospital for his broken leg? What did the bus conductor say to his new girlfriend that works at the zoo? What did the clock say to the calendar on Valentine’s Day? What did the magnet say to the cast iron pan? What did number 2 say to number 1? 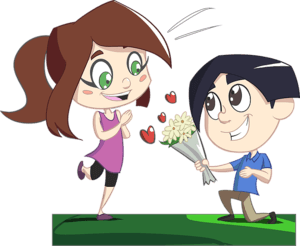 How did the bell propose to his girlfriend? Lucky you! You have a man who is smart enough to solve some riddles about love. Relax and cuddle up with him and share these love riddles for him. Riddles are an excellent way to not only keep your mind sharp but also to bond with each other. Spending time together challenging each other mentally and laughing is a great way to deepen your connection. We hope you both enjoy these I love you riddles. What did the electrical socket say to the plug? What did Leonardo Da Vinci say to Mona Lisa? What did the fly say to the light bulb? I can inflame and ignite a heart with my weapon, so you lovers better watch out. Who am I? If a hippo and an elephant go on a date and profess their love to each another, what would they say? How did the husband show his wife who was the boss of the household? What did the fish say to the bait on Valentine’s Day? You must really love riddles if you made it all the way down here! You might just be worthy of trying out these hard riddles! →We hope you enjoyed these romantic, sweet, cute and funny love riddles and answers! Help make the world a more loving place by sharing.